cocktail stirrers are elegantly designed for bars, clubs & parties. Customer logo can be incorporated for bulk orders. These are made in food grade plastic & extreme care is taken that no sharp edges are there. 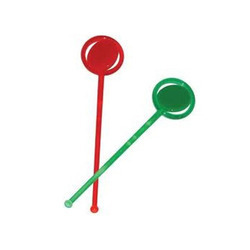 The Cocktail Stirrers offered by us are known for their durability, sturdiness and resistance to damage. Each pack of Glow stirrer contains 3 glow sticks and 3 connectors. So 3 stirrers can be made from each pack. To activate the glow sticks, they need to be snapped along their entire length and then shaken. Once the glow stick starts glowing, it simply needs to be fixed with the connector to form the stirrer. In order to meet excellent quality standards, we are supplying Cocktail Stirrers. We try to enhance customer benefit by presenting higher quality of Cocktail stirrer. These products are available to the clients in various sizes and designs. Size: 2.5 mm and 4 mm Round Sticks. - Usage : Coffee Stirrer, Cocktail Stirrer, etc. Our organization is well known in the market for providing a broad assortment of Cocktail Stirrers to our clients. These elegant and colorfull mocktail /cocktail stirrers and top picks which get used in bar pubs and any luxury lounge with drinks. Buy Pack of 8 Fruit Pattern Cocktail Stirrers (Kitchen Craft, UK) by Master Kitchen at houseproud Browse and shop from a wide range of luxury, designer and vintage Bar. We supply a wide range of acrylic stirrers, which are mostly used in restaurants, bars, coffee shop etc. that match the expectations of our clients. These are used for stirring purposes and come in various colors and shapes.